At Rs11,999, the ZTE Blade A2 Plus is a solid budget smartphone with some very likable features including the big battery, premium design and steady performance. Chinese phone maker ZTE’s Blade A2 Plus, has a big screen, big battery and finger print sensor. Priced at Rs11,999, the Blade A2 Plus’ biggest challenge is that it is competing with the likes of Xiaomi Redmi Note 4 (Rs12,999) and Moto G4 Plus (Rs13,499). 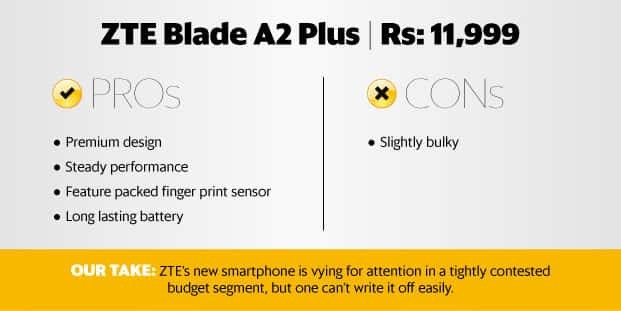 Unlike the Xiaomi smartphone which is available only through weekly flash sale and goes out of stock in seconds, the Blade A2 Plus can be bought right away on Flipkart.com. The Blade A2 Plus’ metal finish gives it a premium look. The Blade A2 Plus is a well designed smartphone with a metal body and a curved back panel. The metal finish gives it a premium look and solid feel while the curved back and flat side panel improves grip over the phone. At 189g, the Blade A2 Plus is a lot heavier than the likes of Moto G4 Plus (155g), but is closer to the likes of big battery rivals like the Redmi Note 4 (175g). The finger print sensor lies on the back panel where it falls comfortably within the range of the index finger. Interestingly, the finger print sensor also serves as a clickable button which can be used as the shutter button when the camera app is open and as call receiving button when the user is getting a call. It also supports touch gesture. Swiping up when the home screen is open shows the recent apps, while swiping left to right in image gallery changes images. The navigation keys on the front are uniquely designed. The home button is represented by a circle while the back and multi-tasking button are represented by a single dot. All keys are backlit. The Blade A2 Plus comes with a 5.5-inch IPS LCD display. The smartphone comes with a 5.5-inch IPS LCD display with good wide viewing angles. It is a bright looking display and has a tendency to oversaturate colours in videos and games. What is likable is that its display is a bit less reflective which results in better visibility in bright light. The phone allows users to customise the display by adjusting colour contrast and colour temperature in the Settings->Display->Miravision. It also has a blue light filter which reduces strain on eyes by subduing the display. Both its rivals offer 5.5-inch full HD displays with display customisations on similar lines. The Blade A2 Plus runs Android (6.0 Lollipop). The phone runs Android (6.0 Lollipop), at a time when new smartphones have started offering Android Nougat. The OS is wrapped under a typical Chinese smartphone interface with no app drawer and big app icons and colourful wallpapers. However, the amount of customisation is fairly limited. The multi-tasking window and the settings panel have more in common with plain Android than custom UIs It has very few preloaded apps, which means less clutter and more free space. One of the features of the interface is the Mi Colour. It allows user to pick any colour from real world using the phone’s camera and then use it to apply in the phone’s wallpaper. Powered by a MediaTek MT6750 processor paired with 4 GB RAM, the Blade A2 Plus delivers a stutter-free performance quite consistently. Though the processor is not as powerful as the Qualcomm Snapdragon 625 running on Redmi Note 4, it was able to handle most day to day chores smoothly. Even with 8 to 10 apps open and running in background, games like FIFA 16 played out well. The phone offers 32GB of internal storage and one of its nano SIM slots can double up as microSD slot, allowing one to add another 256GB to it. The Redmi Note 4 offers 64GB internal storage and supports microSD cards up to 256GB. The ZTE Blade A2 Plus’ main highlight is the 5,000mAh battery which easily lasts about two days on modest use. The Blade A2 Plus’ 13-megapixel camera is good with colours. The 13-megapixel camera which supports phase detection auto focus, dual tone flash, and face detection is good with colours. In indoor shots, colours don’t look washed out and in outdoor shots it doesn’t try to oversaturated colours for more effect. The area where it struggles is detail reproduction. Even daytime shots don’t look very crisp. The phone’s selfie camera is good with colours and detailing even in low light. The Redmi Note 4’s 13-megapixel camera is a bit better when it comes to detailing. At Rs11,999, the Blade A2 Plus is a solid budget smartphone with some very likable features including the big battery, premium design and steady performance. What gives the Redmi Note 4 an upper hand is the more sophisticated UI, superior processor, more internal storage and slightly better display.